Irish small businesses are content to keep their business to their current scale, with only 1 in 4 looking to grow into a national or international business, according to a recently launched study by University College Cork (UCC). The study – Micro-Businesses in Ireland: from Ambition to Innovation – is one of the first reports to examine this important enterprise segment in Ireland, and to compare it with micro-businesses in the UK and the US. Micro-businesses are firms with between one and nine employees, and constitute 90% of business in Ireland, employing over 400,000 people. Microbusinesses account for almost 20% of all Gross Value Added in the Irish business economy. Over 1500 micro-businesses were surveyed to identify their ambition, innovation and adoption of digital technology, and this information was compared to the responses of over 6,000 micro-businesses in the UK and over 2,000 in the US. 71% of Irish micro-businesses are keen to keep their business similar in scale to how it operates now. Just 27% of micro-business in Ireland want to build a national or international business. Adoption of digital technologies by micro-businesses in Ireland is strong and growing. 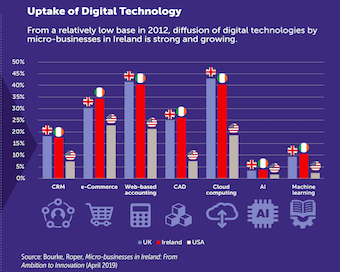 In fact, uptake of digital technologies by micro-businesses in Ireland compares well with those in the UK and is considerably higher than those in the USA. But….3 in 5 small business are failing to adopt common digital technologies such as cloud computing. Microbusiness in the West (Galway & Galway city, Mayo & Roscommon) are amongst the most ambitious in the country, in particular they are keen to build a business with a view to exit. Dublin micro businesses are not markedly more ambitious than micro-business across the country. Levels of innovation in Irish micro-business in Ireland are higher than those in the UK and USA, but innovation varies across Ireland and is lower in peripheral regions – particularly the South East and Border regions. 77% of micro-businesses in Ireland are family owned, the ratio of male to female owners is 2:1 and the ambitions of male and female owners are broadly similar. “These business are our plumbers, our builders, our accountants and our mechanics, they play an important role in the fabric of Ireland’s national and local economy. This study lifts the lid on their ambitions, innovation and growth aspirations and presents an in-depth economic picture of where Irish microbusiness are, versus their international competitors. Government policy is to grow small business but this may not be what small business want” commented the report’s co-author Dr Jane Bourke,economist, Cork University Business School, UCC. The Irish government has plans of improving Small and Medium sized enterprises’ (SME) productivity by 1% by per year to 2025. While, Future Jobs Ireland, has identified the need to incentivise SMEs to invest in new technologies. This report was authored by Dr Jane Bourke and Professor Stephen Roper at Warwick Business School and represents a collaboration between the Spatial and Regional Economics Research Centre (SRERC) at Cork University Business School, UCC and the UK’s Enterprise Research Centre (ERC).